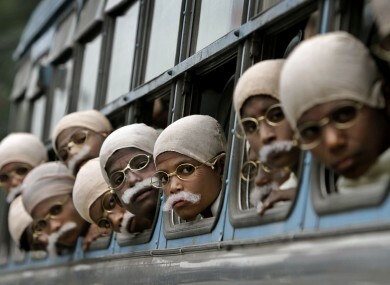 Underprivileged Indian children dressed as Mahatma Gandhi arrive for a world record attempt in Kolkata, India. EVERY EVENING, TheJournal.ie brings you a roundup of the day’s main news – as well as any bits and pieces you may have missed. Transport minister Leo Varadkar has defended his request for a special adviser to be paid €135,000 a year – roughly €42,000 more than the official Government pay cap. He said it didn’t break the rules. An air and sea search was launched this afternoon for a fisherman missing after he went overboard off Co Louth. Gardaí have begun an investigation after a woman’s body was found in a bag on a side street in Cabra, north Dublin city this morning. Bad news: this miserable weather will be with us all week. It’s going to be cold and wet – and we might even see snow. Sinn Féin have again warned that they will consider legal action to force the Government into holding a referendum on the EU treaty – as Greece looked set to win a landmark 60 per cent reduction of its debt. iPads, helicopter raids, and being swallowed by a whale: enjoy our selection of the very best reads from around the web this week. Are you paying too much tax? Then you’re probably not a millionaire – nearly half of them paid less than 30 per cent, new figures show. Is this the best reason to have children ever? (It’s a video). We may be all equal in death, but some bodies are uglier than others. Check out our slideshow of famous people’s death masks. Meeting schoolchildren, testing mattresses, stroking large stuffed animals – it was a busy day for new North Korean leader Kim Jong-un, if this video is anything to go by. One lucky Dublin punter won more than €38,000 on the horses yesterday, after placing a €32 bet. From borrowing to bombs – it’s the week in quotes. In a grisly protest, hundreds of prisoners have sewn their own lips shut in Kyrgyzstan using wire or coarse twine. Brazil’s famous bikinis are getting bigger, as the country’s waistlines expand.